Art Fair // The (e)merge art fair in Washington, D.C.
(e)merge Art Fair checked into the Capitol Skyline Hotel, located near Capitol Hill in Washington, D.C., from October 3–6, 2013. The fair, mounted for the third consecutive time this year since its inception in 2011, embraces and realizes the goals of the D.C.-based CONNERSMITH gallery owners and fair founders, Leigh Conner and Jaime Smith. By exhibiting unrepresented artists alongside established galleries in an alternative venue space in the U.S. capital, Conner and Smith once again created a platform where many voices in the contemporary art world came together to create a dynamic fair experience. The fair was divided into two conceptual platforms: galleries and artists. Solo artists were carefully vetted and selected by a jury—comprised of renowned museum directors, curators and artists—their work displayed in the parking garage, on the first floor of the hotel, in the gym, and on the pool deck. Gallery platform artists needed to satisfy one prerequisite: that they not have had a solo museum exhibition before. The fair is a unique opportunity for emerging artists, both those unrepresented by galleries, or who have not previously had museum shows, to gain exposure to a diverse audience. Visitors to (e)merge passed the hotel front desk to arrive at the art fair registration booth—some confused, others fully aware of the event’s logistics. Alida Anderson Art Projects occupied two rooms on the second floor that were essentially emptied of hotel furnishings to house the works of three artists. 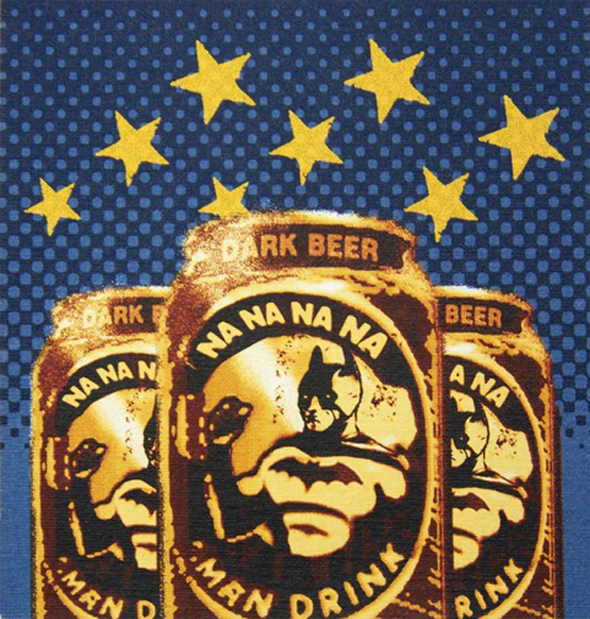 Cuban-American artist, Ric Garcia’s print Na Na Na Na Man Drink 13 (2012) featured the typical coloration and poses of the famous Cuban soft drink Ironbeer, but altered the text to reflect its English meaning visually and linguistically. Cuban-American artist F. Lennox Campello includes potent historical, religious and pop cultural figures such as Frida Kahlo, Batman, the Biblical Eve and Che Guevara in his multimedia works. 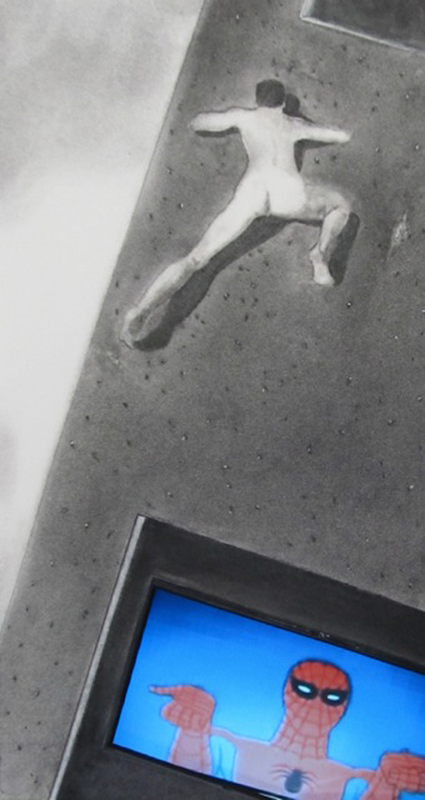 In Campello’s Spiderman Naked (2013), a bare Spiderman is rendered in charcoal, climbing the side of building. Below him is an embedded appropriated, looping video of the cartoon Spiderman, where audiences can see the hero fully clothed and using his powers in action. CONNERSMITH’s space housed a solo exhibition of Baltimore-based artist, Ali Miller. Her most recent pieces were on display. The artist’s fantastical use of colors—unforgiving greens, luscious magentas and static, lunar whites—create forms that present a perception of the world in motion and one often times operating outside the paradigms of its own reality and standards. Galleries from outside U.S. hailed from Germany, the Netherlands, France, and Italy. Berlin-based ROCKELMANN & mounted an exhibition of four artists. Interested in the curation of installations and new media, the gallery offered a variety of artistic templates for visual engagement. Florian Japp’s pieces are comprised of objects and components of objects, making defining the whole difficult and perhaps even irritating—an emotional response the artist is comfortable and even pleased to elicit. Jeffrey Teuton’s personal myths materialize through color and basic shapes on paper, canvas or linen. A writer, Teuton’s solid blocks of color, stacked and organized in various configurations, can also be appreciated as a kind of abstracted alphabet, a language that is phonetically silent, but expressively vibrant. Silence is not an experience viewers had when interacting with French-born, Finnish artist Tristan Hamel’s Down River Vashka (2013) installation. The work highlights the intersections of art and linguistics, drawing attention to the Komi language in Russia. 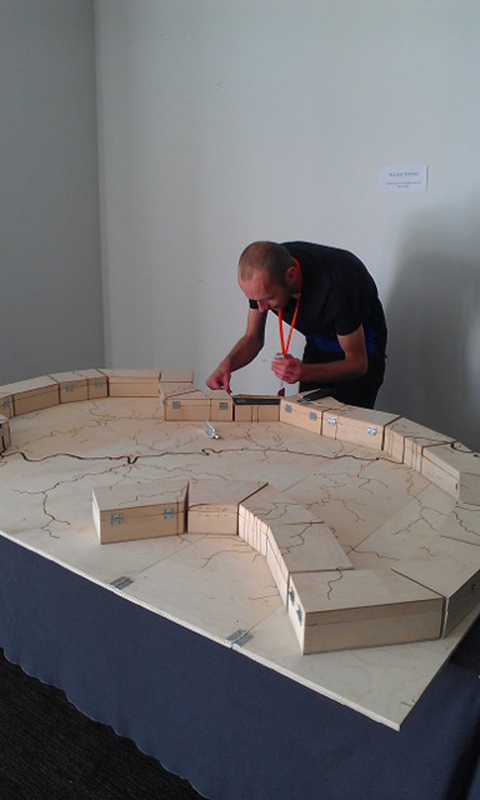 Over a dozen wooden boxes were arranged on top of a plywood map. A “PLEASE TOUCH” sign was posted next to the work to encourage the audience to interact with the boxes by opening them and activating the sounds. The interiors contained models of landscapes and villages, birds flying into nests, drawings and other materials and scenes. Short sound clips of people’s voices speaking Komi, which were produced during linguistic research, were not accompanied by translations. Tristan Hamel – Down River Vashka (2013). Wood, electronics, various materials (sand, water, moss, paper, ink, metal, carton, glue, etc.). Image: Courtesy of writer. Performances were also scheduled throughout the duration of the fair. 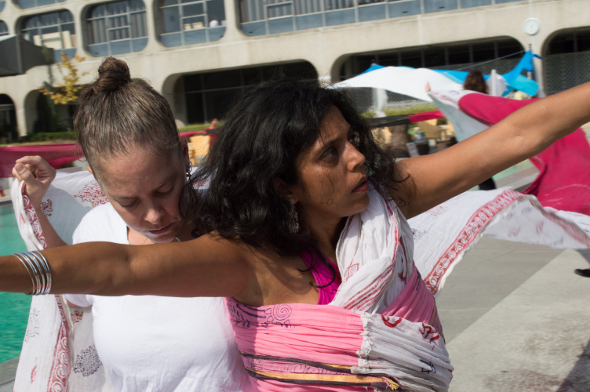 DC-based, Bangladeshi-American artist-activist, Monica Jahan Bose performed Unwrapped. With a 216-foot sari—covered with writing from the women of Bose’s ancestral island village in Southwestern Bangladesh as part of a storytelling and eco-empowerment project—Bose wrapped and unwrapped her body with the help of volunteer performers. The action developed on the hotel’s pool deck. Bose turned this religiously neutral space into a type of sacred platform, inspired by a mythical Indian tale and her grandmother’s marriage at age seven. Stepping back, the entire fair was an installation, a reworked place of leisure to stage interactions that facilitated the exchanges among emerging artists, established galleries, seasoned collectors, new collectors, the art dilettante, students, and many more from the Metro DC area as well as from across the U.S. and the globe. For more information about the (e)merge Art Fair visit the website. Miryam Haarlammert currently lives in Washington, DC and is the Editorial and Events Management Assistant at the American Architectural Foundation (AAF). She received her Master of Arts from the University of Helsinki in Finland in Art Theory, Criticism, and Management in May 2013. After a year in Helsinki and prior to joining AAF, Miryam interned at ArtAsiaPacific art magazine in Hong Kong as an Editorial Assistant. She has completed internships at Kicken Berlin in Berlin, Germany and at David Castillo Gallery in Miami, Florida. She holds two Bachelor of Arts in Art History and in English from Florida International University. Miryam is also a contributing writer for various arts and culture magazines.